Ovie Ejaria looks to be coming on leaps and bounds for Rangers. The youngster is on loan with the Scottish club for the campaign and is under the guidance of our legendary midfielder Steven Gerrard, who left his role as U18s manager to take charge north of the border. 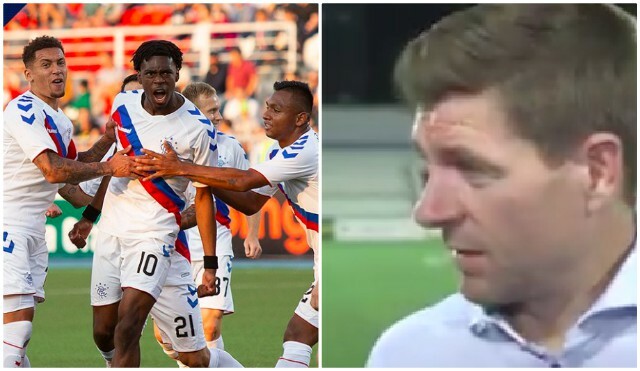 Ejaria has two goals so far, one in the SPL and a scorcher v UFA last night, which helped confirm Rangers’ progression into the Europa League Group Stages. Gerrard has waxed lyrical about the 20-year-old, who is already an automatic starter in his midfield. “Ovie’s goal was sensational,” he told Rangers TV, cited in the Star. “I think his last four performances he’s become a man. “He’s performing at a higher level. “He’s been really good since he’s come through the door but he’s getting better and better and growing. Ryan Kent is also spending the campaign with Rangers, so we hope the English winger can make similar strides. Ejaria is a rangy, technically capable midfielder, but lacked the tactical discipline and physicality to play for Liverpool last term, having got himself on the precipice of the first-team back in 2016. This spell looks like it’s doing him wonders, however, which is terrific to see. Being head and shoulders above others in the SPL is a good measuring stick of potential, too. Remember, Virgil van Dijk played for Celtic, as did Victor Wanyama, and both are regarded as elite in their respective positions in the Premier League.